Forgive the excessively esoteric sound of this dish’s name. I had tried coming up with other things to call it: Roasted Cauliflower and Broccoli and Braised Broccoli and Cauliflower Greens with Navy Beans and Creamed Potatoes? Too long. 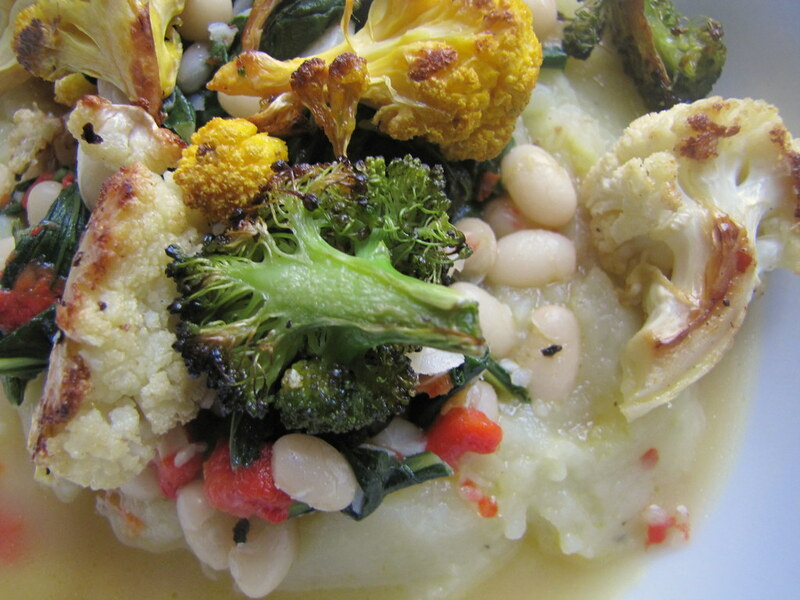 White Cauliflower, Cheddar Cauliflower, Broccoli and Their Combined Greens Braised with Navy Beans and Roasted Red Pepper and Served on Creamy, Truffled, Mashed Fingerling Potatoes? Too specific. Stuff That I Got From My CSA This Week, Cooked and Piled Ceremoniously Together on a Plate? That sounded better. But it was still pretty dense. I think the main thing to chew on with any dish should be the food, not the words. Oh, and then there’s the “brassica” part. Did that sound a bit geeky, too? Don’t worry, I’m not going to go all ag-talk on you, and from here on refer to tomatoes and eggplant as “nightshades.” I’m basically lumping together cauliflower and broccoli under their umbrella plant type, which I’ve been seeing all sorts of members of lately, everywhere. 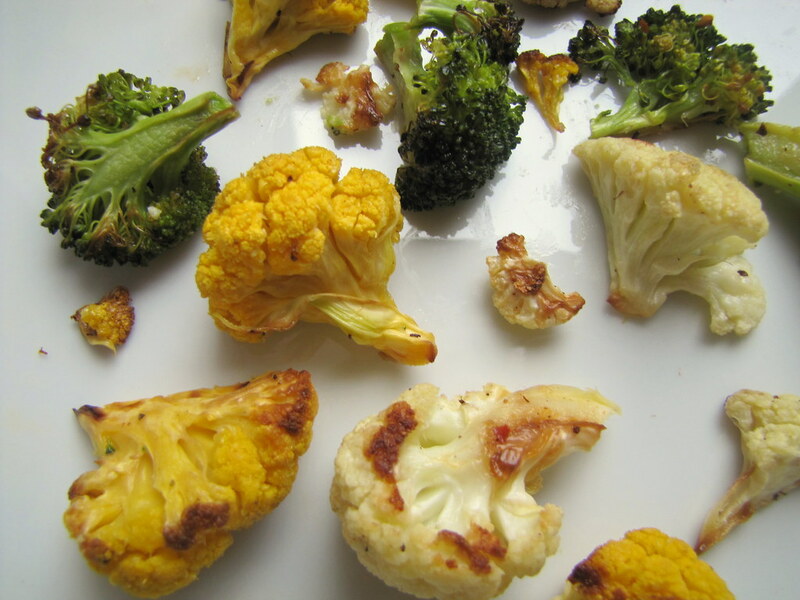 Yes it’s a good time for brassicas — sorry! 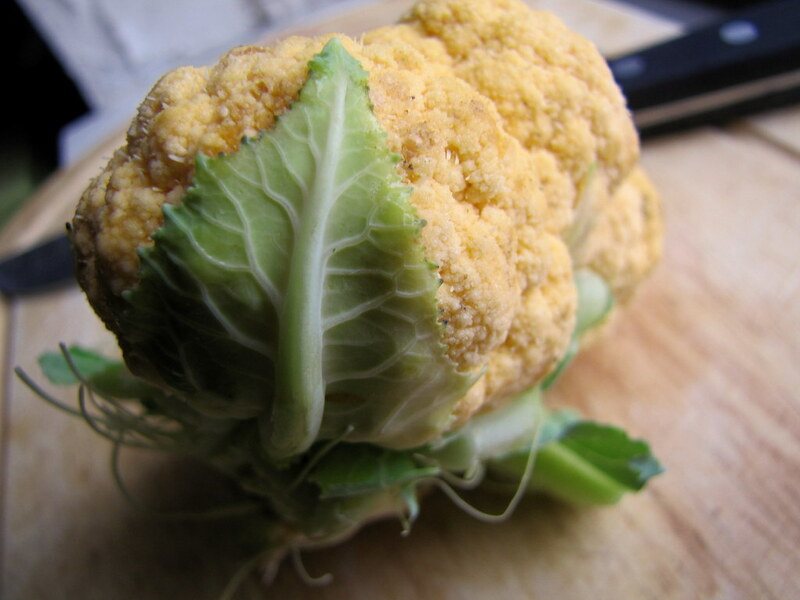 — that is, Brussels sprouts, cabbage, broccoli, romanesco, cauliflower of all colors, and more. These veggies all share a distinct cabbagey taste and smell that’s borderline bad because it’s slightly sulfuric. If you ask some people who just detest Brussels sprouts (a strong one of the species in taste), it’s just bad. But if you cook it right, like giving it a nice crisp of caramelization, then it’s really quite good, I think. I saw a tons of cauliflower and romanesco, for example, at CENYC‘s second-annual Taste of Greenmarket fundraiser event last week. Chefs from some of the city’s most renowned restaurants were called on to prepare small plates using seasonal Greenmarket food for that night. My favorite offering was Telepan’s ricotta gnocci, which was surrounded by buttery, crisp-tender sauteed cauliflower, Brussels sprouts and white beans. But many other restaurants went heavy on brassicas, too, taking them to soaring new heights. Peter Hoffman of the Back Forty and Savoy made a “Brassica Salad” (so you can see how I don’t feel too bad pulling that plant term out of the fields now) and crispy Brussels sprouts; somebody else made pickled cauliflower and romanesco that I ate too fast to remember, but I think it might have been on one of the plates from Tom Colicchio of Craft. 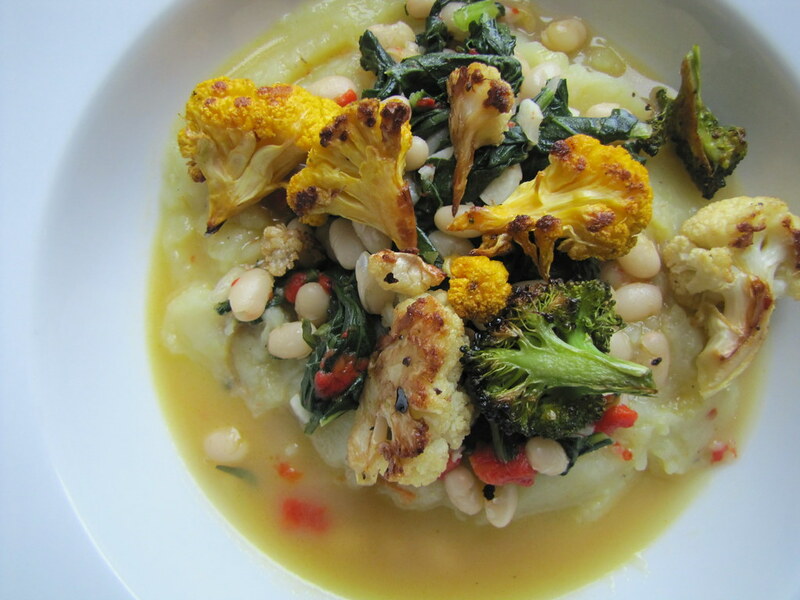 Patti Jackson of Trulli made sauteed Spigarello broccoli, a rare variety, to go with fried rabbit and squash puree. Oh, and there was lots of squash seen that night, too — lots and lots of them, and much of them, kabocha squash, interestingly. But we’ll get to that another time. It was a wonderful evening, a celebration of the Greenmarket’s efforts and the deliciousness of its fall bounty. And you might be able to detect that I was quite inspired, because the first thing I did was recreate something buttery, cauliflower and bean-strewn like my favorite gnocci of the night. Was it as good as what I’d “tasted of the Greenmarket”? My memory’s blurred by the wine, but probably not. Was it darn tasty, and easy to make at home? Of course. (I’m completely sober, by the way.) I roasted the broccoli and cauliflowers first, to give them a golden crust. This gave my little ragout creation texture as well as heightened flavors. 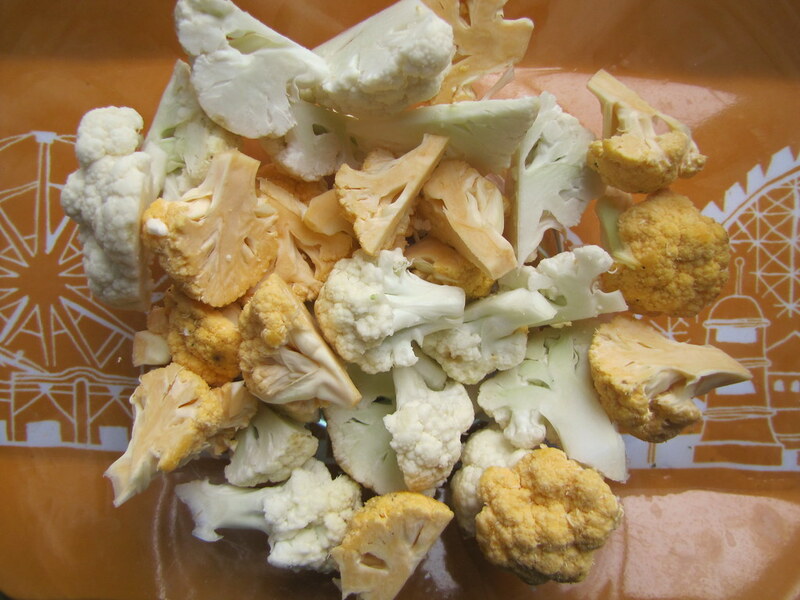 In the meantime, I cooked down the broccoli and cauliflower’s green leaves, which are perfectly edible, and the heads from my CSA stash came with plenty of them intact. These greens are a little tough, especially the outermost ones, and can benefit from a good braise, so I did so with some homemade vegetable stock. 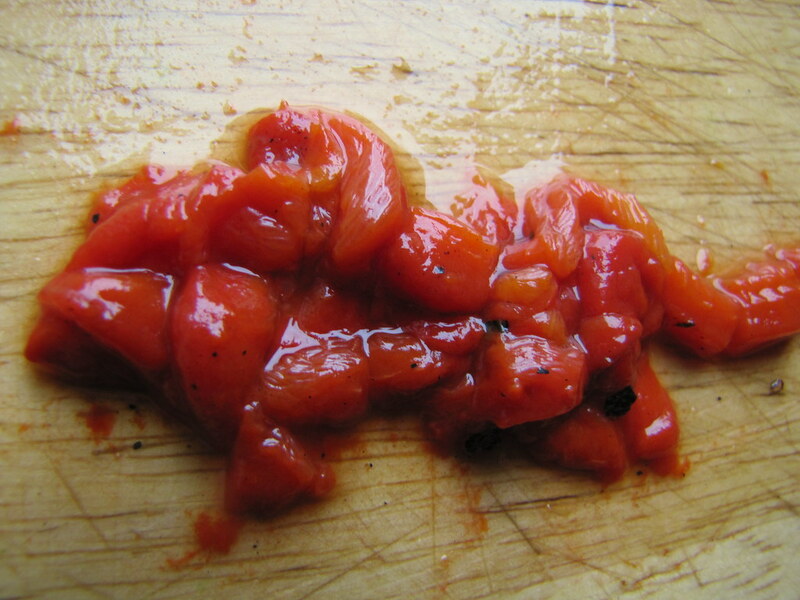 For color, I added some chopped flecks of roasted red peppers, which I jarred earlier this season. A little spice from red pepper flakes went in, too. 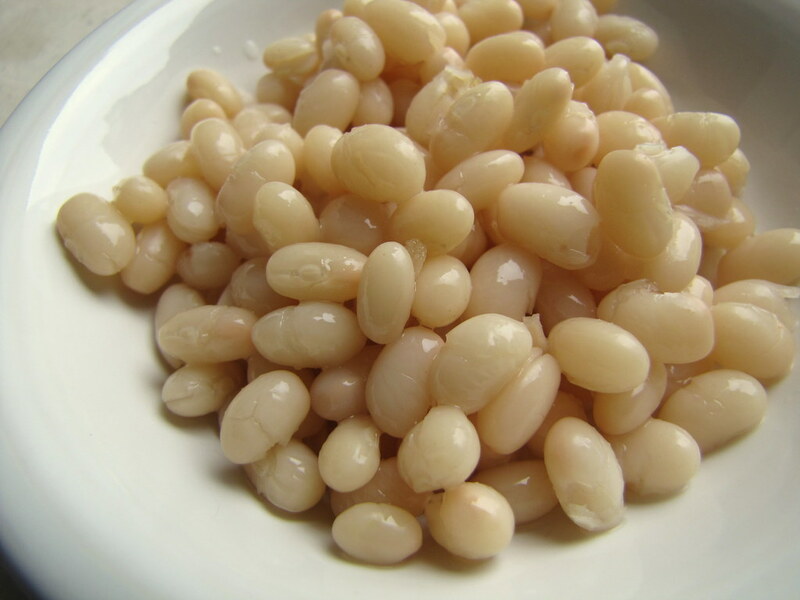 The white beans, navy, in this case, were already soaked and cooked, and once added to the braise they lent it a little bit of starch. The whole thing was served (the braised greens, with a soupy, buttered sauce, and the crisped cauliflower and broccoli on top) with a mound of mashed potatoes that I stretched with cream and white truffle oil. Odiferous and sulfuric it was not. So that’s one way of cooking some brassicas, its flowers and leaves both: over potatoes with beans, in a ragout. Whatever that means. Preheat oven to 400 degrees. Toss broccoli and cauliflower with enough olive oil just to coat, and pinches of salt and pepper. Place in a single layer, with no pieces touching, on a baking sheet and roast for approximately 8 minutes. Flip pieces over with a spatula and continue roasting about 2-3 minutes longer, or just until sufficiently golden and slightly charred (the broccoli florets will char quickest). Meanwhile, bring a pot of water with the potatoes fully submerged to a boil. Once tender, drain water and mash. Add a splash of stock and over very low heat, continue adding the cream, truffle oil, optional cheese, salt and pepper to taste. Stir until combined and add more of anything to taste. Heat the remaining tablespoon or two of olive oil in a saute pan with a lid and add the garlic, brassica greens and optional red pepper flakes. 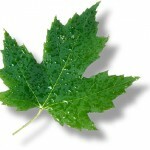 Season with salt and pepper and cook, stirring rapidly, over high heat until just wilted. Add the stock, beans and roasted red pepper; bring to a boil and lower heat to a simmer. Cover and let cook 15 minutes, checking to add more stock if it’s becoming too dry. Remove lid and taste for seasoning. Add enough stock or cook enough of it off until the mixture is as soupy as desired. Add the optional fresh lemon juice to taste. Add the butter, remove from heat, and stir to incorporate. To plate, spoon the potatoes onto the plate first, followed by the braised greens mixture, and top with the roasted cauliflower, broccoli and an optional squeeze of extra lemon. Three brownie points: Just about as healthy and nutritious as a whole meal as it is tasty. Which is, very. This dish has it all: protein from the beans, plenty of vitamins like A, K and C from vegetables and leafy greens, and starch from the potatoes. Alright, it has sufficient fats, from the butter and cream, but you can go easier on these ingredients, or remove the cream entirely. It’s highly changeable, so mix it up. Eight brownie points: This dish is testament to my CSA nearing the end of its season: over the spring, summer and early fall, I’ve garnered so many ingredients that I’ve cooked either fresh, or preserved in some fashion and have stored, waiting to be used up. So the vegetable stock was made with root vegetables, carrots and celery that was cooked down and kept frozen, and the roasted red peppers were from the late summer, and jarred. These became seasonings for a dish of mostly fresh, in-season vegetables from my CSA (the potatoes, cauliflower and broccoli). The beans were dried and reconstituted from a large bag, a more waste-efficient (as well as healthy and more economic) alternative to purchasing them canned. Cathy, that looks so yummy. I love the idea of making a ragout from beans — we just did one on our site with white beans, potatoes, and red chard. 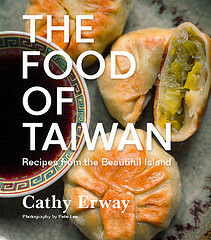 Hi Cathy, just want to pop by and say that I’m a long-time reader as well and I wanted to thank you for inspiring my to go without dining out for November. So far so good, (ha, on day 3!) and I wanted to recommend a great artichoke recipe from Real Simple. Lemon-braised artichokes. Literally mix up lemon juice, garlic, olive oil, and salt and pepper with quartered artichokes and pile it into a dutch oven to bake at 350 for an hour. Oh man, sooooo goood! A girl could get used to this! 30 Awesome Things About Breaking My Foot | oh, what? I made the Brassica Ragout tonight and had to restrain myself from devouring the whole thing. (And btw, I didn’t have navy beans so I used black beans and it was fine. Used half and half instead of cream (my heart, dontcha know), no red peppers either. )Still, it was TERRIFIC!